Deaf Smith - Eyes of the Texas Army. Texas history is filled with stories of heroism and dedication to duty. During those dark days of the Texas Revolution many men came forward and represented themselves well in the war with Mexico. When we think of those times, the names Travis, Houston, Austin, Bowie, and Crockett quickly come to mind. There were many others, however, who were just as important to the Texas cause. One of those was Erastus "Deaf" Smith. If he was around today we might call him, a "Yankee." You see, Deaf was from New York state � but there was none more dedicated in the Texas fight for freedom than this man. Although he lost his hearing due to a disease at the age of 11, Smith never seemed to let this impairment stop him from serving the people of Texas. Deaf Smith settled near San Antonio in 1821. He married a Mexican widow, Guadalupe Ruiz Dur�n, in 1822. The couple had four children, all daughters. In 1825, Smith moved to DeWitt's colony and settled on land about a mile west of Gonzales. According to �The Handbook of Texas,� Gonzales was considered the first American settlement west of the Colorado River at that time. At the outbreak of the Texas Revolution, Smith's loyalties were apparently divided. He considered himself a Mexican citizen and he had a great love for the Mexican people. Some say that he joined the Texans only because a Mexican sentry refused to allow him to enter San Antonio to visit his family. The town was under siege by Stephen F. Austin's army at the time and, in his anger, Smith joined that group. The Texans were, no doubt, glad to have him. It seems that the Mexican citizens of San Antonio had a fondness for Deaf Smith. They probably kept him well informed of the temperament and ability of the soldiers defending the city. He reported that the troops of Gen. Martin Perfecto de Cos were "disaffected to the cause they are serving." Because of his steady source of information and his detailed reports, Deaf Smith soon became know as the number one spy for the Texas army. 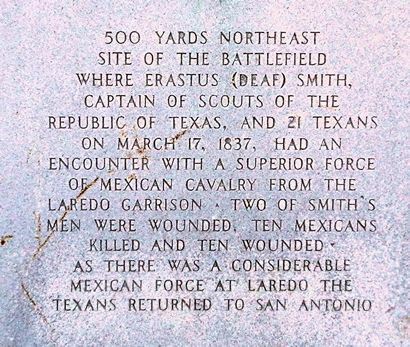 On December 8, 1835, Deaf Smith guided the Texas troops into San Antonio. He was shot on that day while on the rooftop of the Veramendi Palace. Ben Milam was killed at the door of that structure at about the same time. Although Smith was severely wounded, he remained with the army. According to his leaders, Smith was "well known to the army for his vigilance and meritorious acts." They also said that his services as a spy could not be equaled by anyone. After he recovered from his wounds, Deaf Smith became a messenger for William B. Travis at the Alamo. Travis called Smith, "The bravest of the brave in the cause of Texas." Smith was away from the Alamo delivering letters from Travis to Sam Houston when the Mexican army made its final assault. Houston sent Smith back to San Antonio to learn the status of the garrison there. It is obvious just how much Houston trusted the ability of Deaf Smith. In a report to Thomas Jefferson Rusk, Houston wrote: "If living, [Smith] will return with the truth and all important news." Smith did return to Gonzales with some of the Alamo survivors � these included Susanna Dickinson and her baby daughter, Angelina. At the battle of San Jacinto, Deaf Smith again performed his duty without regard for his personal safety. He captured a Mexican courier who was carrying important dispatches for Gen. Santa Anna. These documents gave Houston information on the strength of the enemy and when Santa Anna might be reinforced. On April 21, 1836, Smith was ordered by Houston to destroy Vince's Bridge and cut off any hope of escape by the Mexican army (or anyone else). Deaf Smith's service to Texas went far and beyond the call of duty. While he was at San Jacinto, his family was living in Columbia, Texas. The war had left them penniless. 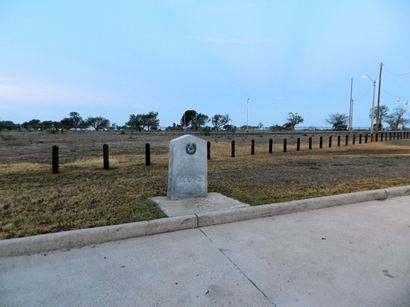 On November 11, 1836, the Texas Congress granted Smith the property of Ram�n M�squiz on the northeast corner of San Antonio's Military Plaza as a reward for his service to the army. Nevertheless, Smith and his family remained in Columbia. Although he resigned his commission in the army, Smith went on to organize and command a company of Texas Rangers. On February 17, 1837, this group defeated a band of Mexicans at Laredo. This was to be Deaf Smith's final battle. He left the rangers and moved to Richmond, Texas. He died there, at the home of Randal Jones, on November 30, 1837. Sam Houston was devastated at the passing of Smith. In a letter written to Anna Raguet, Houston wrote: "My friend Deaf Smith, and my stay in darkest hour, is no more!!! A man, more brave, and honest never lived. His soul is with God, but his fame and his family, must command the care of his country!" I don't believe Erastus (Deaf) Smith was a man who really sought fame. He apparently had a great love for his family and country. I wonder if the course of Texas history would have been different � if that Mexican sentry had allowed him to visit his family during the siege of San Antonio.